What are As Built drawings used for? A finished building rarely corresponds exactly to the original plans in every detail.This normally happens because of unforeseeable on-site complications and variations from the original plans. Sometimes such discrepancies may occur accidentally and may be economically unfeasible to rectify, and that’s The purpose of as-built measurement : to record these variations. real estate .Real estate companies,transactions and marketing developers, construction consultants, architects, engineers, interior designers, and property and facility management companies all need this service at different levels of their work to provide a professional and accurate report on existing conditions of any given building. 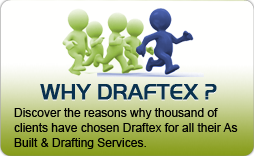 By using the most technologically advanced equipment supported by the most high tec software Draftex records all these variations and converts them into the most accurate and advanced as-built drawings.